1.) First of all, thank y'all so much for your kind comments on yesterday's post and sharing in Scott's good news. He's really looking forward to getting started next week and being among the busy workerbees again. The way everything has come together so smoothly for this new job, after a long patch of nothing, has definitely been a God thing. We are so thankful! Oh yeah. It did. And it was so good. We showed up, merrily, for the first showing Tuesday morning, and were quite stunned to see the price flash up on the auto-ticket thingie as $12.00 each. What in the world? 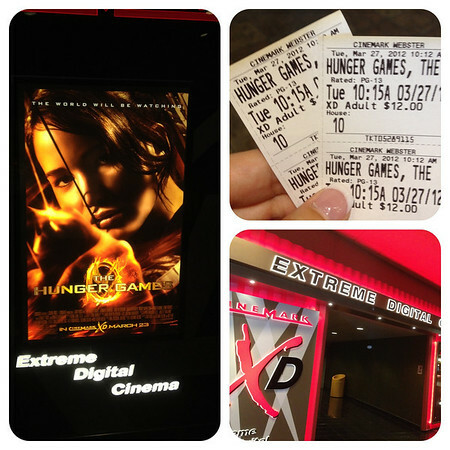 We soon clued into the fact that the first showing was for the fancy schmancy XD experience. Meh. Since the next showing wasn't until 10:55 and we were already there, Scott gave the green light to blow $24.00 on an early bird matinee that should have cost us $11.00 for both. I don't know if the XD effects were all that special, having nothing to compare it to, but the theater was swankier, roomier and the seats were leather. So there's that. And may the odds be forever in your favor. 3.) Remember a few weeks ago when Annelise was all up in tracking the Iditarod mushers? Well, look what a sweet, sweet bloggy friend sent her in the mail!! Straight from Alaska!! 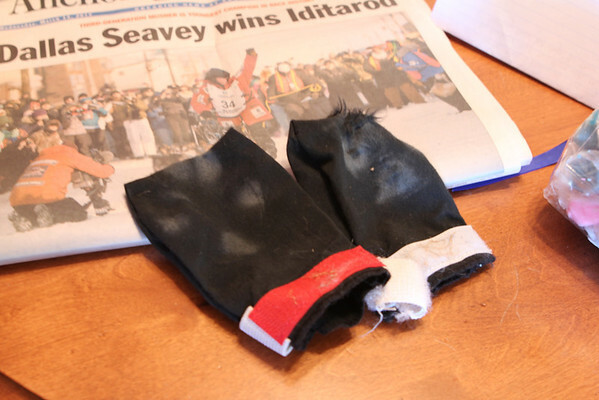 Those are ACTUAL sled dog booties (see their little paw prints?) from actual sled dogs that were cast off along the trail. Along with the booties, there was an Alaskan grown t-shirt for Annelise, a moose nugget necklace (so neat, although I'm taking a leap and assuming the nugget is a fancy way to say petrified moose poo), a cool Ulu knife for me and salt water taffy, which the mushers snack on to keep their energy up while doing all the mushing. Annelise was beside herself with glee and jumped up in the air squealing for at least several minutes when she opened the box. She could not wait to take everything to school and show her class (and share the taffy), which she did on Tuesday. Thank you SOOOO much Charity!! This was such a special treat!! 4.) We've been on a quest this week for the best chocolate chip cookie recipe. For years I was a back of the Tollhouse bag faithful (remember the Friends episode when Monica tried to make Phoebe's favorite chocolate chip cookies? ), then last year I was sure I'd stumbled upon the best ever chocolate chip cookie recipe, with the secret weapon being adding a box of vanilla pudding to the batter. We made them on Tuesday. But I wondered if a better chocolate chip cookie might still be out there, ever eluding me, just past my grasp. I remembered Edie claiming her chocolate chip cookies could not be beat, so I gave them a whirl on Wednesday. How could you go wrong with butter and oil? You can't. Although your arteries might have a little something to say about that. They turned out great, but they have more of a pecan sandie (chocolate chip sandie) thing going on because of the extra flour (I think). Still soft and chewy but crumblier. And they'll leave a grease ring on your napkin (remember that whole butter and oil thing happening?). I like how clear and concise I can be, don't you? So which ones were the best? Well, they were both good, I mean, hey, it's a chocolate chip cookie. I do think my people and I prefer the first batch (with the vanilla pudding). Not that we won't eat the second batch of course, I mean, hey, it's a chocolate chip cookie. 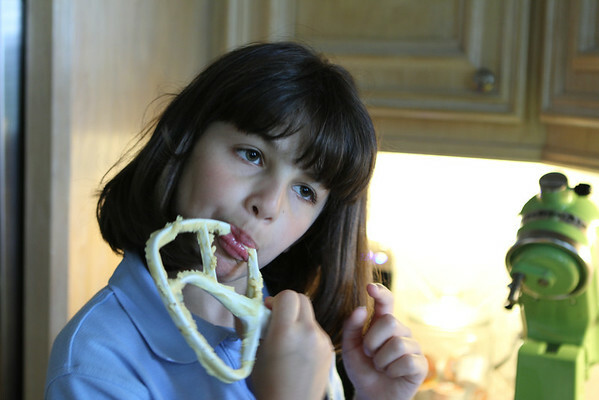 Do you have a favorite, tried and true chocolate chip cookie recipe? Do tell. Please. Seriously. I'm slightly obsessed. 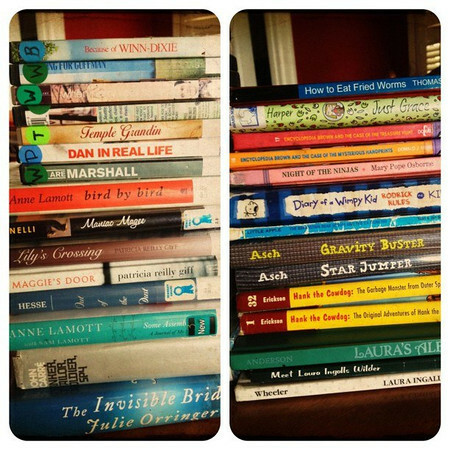 Annelise and I popped into the library, AKA our happy place, the other day and popped back out with our hands full. Have a happy, happy Friday (and weekend), y'all! First...yeah for Scott! :) I'm so happy for y'all. I know this is an answer to prayer! 2nd...love the alaska stuff. I really want some taffy! 3rd....Hunger games? Have the book, haven't read it...will see the movie. You know me. 5th...your not a nerd and I would kill to have your reading skillzzz. haha! Oh an 6th....I need the cookie dough recipe with pudding...or do I have it? I too, love the pudding chocolate chip cookie recipe....I actually found it here on your blog. have you tried it with chocolate pudding instead of vanilla? it is to DIE for! 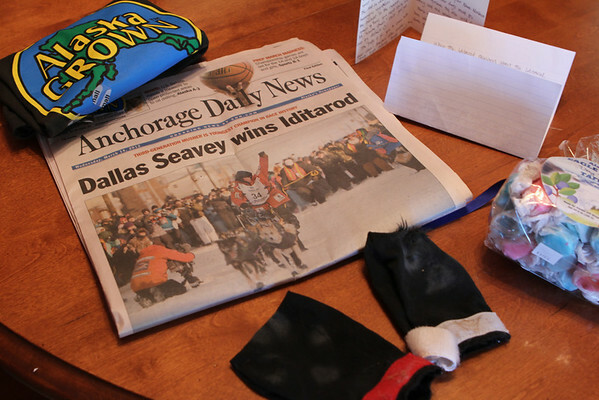 Really cool Alaska care package for Annelise. I bet she was so excited! And I'm totally with you on the Phoebe/Monica cookie thing. I'm a die-hard Tollhouse girl. Annnnnnnd, if A does not bring the nugget to church on Sunday, I may cry. That's all. Oh, and that is possible the BEST good mail ever. ever, ever. WOW on the Alaska package!!! amazing! what a perfect "show and tell" to share! I loved Hunger Games too, as you know.